Were You Treated With Taxotere Chemotherapy for Breast Cancer? Have you received Taxotere chemotherapy treatment for breast cancer? Did you experience permanent hair loss or baldness(alopecia)? Baldness is considered permanent if it lasts more than 6 months. Sanofi-Aventis, the manufacturer of Taxotere, a popular chemotherapy drug is being investigated for failing to warn adequately about the significant risk of permanent hair loss or baldness. Sanofi-Aventis, the manufacturer of Taxotere is alleged to have failed to adequately warn patients about permanent baldness and so deprive them of the option to choose other chemotherapy drugs that are just as effective without the risk of permanent baldness. Baldness is considered permanent if it lasts more than 6 months. The Dr Shezad Malik Law Firm based in Dallas, Texas is currently accepting breast cancer Taxotere baldness cases in women in all 50 states, including California, Florida, Illinois, New York and Texas. If you or somebody you know developed permanent baldness after Taxotere chemotherapy, for breast cancer you should contact our lawyers immediately for a free case consultation. Please use the form to contact us or call us toll-free 24 hours a day at 888-210-9693 ext 2. or 214-390-3189. Baldness is considered permanent if it lasts more than 6 months after the last dose of Taxotere. Sanofi-Aventis, the manufacturer of Taxotere, is accused of failing to adequately warn about the risk of permanent hair loss. Baldness is a common side effects of Taxotere, a significant percentage of patients experience permanent hair loss. Studies by Sanofi-Aventis estimates the risk at about 3%, but other studies suggest the risk may be as high as 10% or more of patients. Evidence linking Taxotere and hair loss has been around for years. In 2006, Dr. Scot Sedlacek found that 6.3% of breast cancer patients grew back less than 50% of their hair after they were given Taxotere in combination with Adriamycin (docorubicin) and Cytoxan (cyclophosphamide). Shirley Ledlie was given Taxotere for breast cancer in October 2005. According to Ledlie, "There never seemed to be any doubt that my thick, shoulder-length auburn hair - my crowning glory - would grow back. 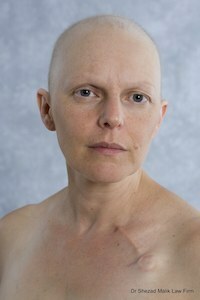 I wore scarves and hats quite happily until I finished treatment in early 2006 and waited patiently for my hair to appear - yet it only came back in an extremely sparse way that resembles male-pattern baldness and means that I have to regularly shave my head because it looks even worse than having no hair at all. Ledlie says, "I feel dreadful, not only about the way I look, but about myself. I am unrecognizable as the woman I once was. I avoid looking in the mirror and I hate shop windows because I see an 80-year-old, ugly old man - or someone going through chemo, which I'm not any more." "It has been 3 years and 4 months since I lost my hair to Taxotere. My life has totally changed. I have lost the vibrant personality I used to have. I hide under hats and wigs. I have so little hair I shave it all off. I would rather look at a bald head in the mirror than the freakishly little hair that does grow. Life can never be like it used to be." After receiving post-marketing reports of patients on Taxotere who developed permanent alopecia, the FDA ordered Sanofi-Aventis to updated the label in December 2015 and the new warning label went into effect in January 2016. Chemotherapy medications destroy all rapidly-growing cells, including cancer cells and healthy cells. Since chemotherapy destroys cancer, it also causes hair loss. Hair loss usually starts 10-14 days after starting treatment, continues during treatment, and starts growing back 4-6 weeks after the end of treatment. For some chemotherapy women patients, hair loss is the worst part of cancer treatment. It can be emotionally distressing and physically disfiguring. The impact on self-esteem and quality of life can be devastating. The Dr Shezad Malik Law Firm based in Dallas, Texas is currently accepting Taxotere baldness casess in all 50 states, including California, Florida, Illinois, New York and Texas. If you or somebody you know developed permanent baldness after Taxotere chemotherapy, you should contact our lawyers immediately for a free case consultation. Please use the form to contact us or call us toll-free 24 hours a day at 888-210-9693 ext 2. or 214-390-3189.